I have created this oil to compliment my Green Devil working to collect debts, money owed or draw in fast cash and luc. 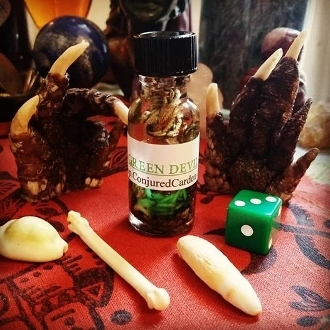 Created with basil essential oil, my lucky green rice, rose of jericho, fennel seed and a green evil eye. Directions; Use a Green Devil candle or green candle. Carve your debtor's name, with information such as amount owed, OR carve the amount of money you need at this time. Rub the candle with my Compelling oil or Green Devil oil. Write the debtor's name OR amount needed on a brown piece of paper 9 times. Then cross with "release my money to me". Anoint all 4 corners of the paper with Compelling oil or Green Devil oil. Place the paper beneath a plate or saucer. Place the candle on the plate and light over 7 days. Each time you light it, speak as to who owes you the money or what you need the money for, commanding it to be released to you. On the 7th day, burn the paper in the flame of the candle.